Robert Thorpe-The First Kashmiri Martyr. 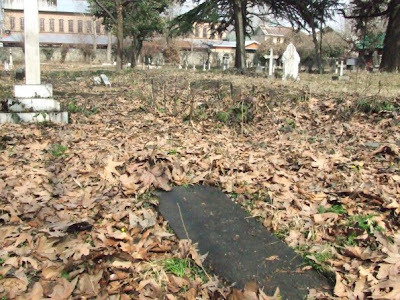 Thorpe left his luxurious life in England to come to the rescue of starving and ragged people of Kashmir but we don’t have any business in paying a visit to his grave. Robert Thorp’s father visited Kashmir in those fateful days. Somewhere in the lush green meadows of the beautiful Valley, he came across a Kashmiri girl and lost his heart to her. They married and went to England. Robert Thorp grew up in the kind lap of his Kashmiri mother who would tell him stories about Kashmir and the sufferings of the people who lived in the most beautiful part of the world. And, finally when junior Thorp visited the paradise on earth he was smitten by its the beauty. However, the sufferings of the people and the way the rulers behaved with them pained him. He decided to help Kashmiris and came out openly against the then Dogra rulers. He wrote a book "Kashmir Misgovernment" which is still considered a valuable reference book on Kashmir. The activities of Robert Thorp gave sleepless nights to the rulers who employed every overt and covert method to silence him. However, he proved a hard nut for them and did not budge an inch from his stand. Instead he chose to become the first martyr of Kashmiris’ struggle for independence. Unfortunately, the natives ignored their hero. Very few people know about him. Nobody has worked on him other than the renowned intellectual Fida Muhammad Husnain. Even the successive governments that ruled Kashmir after the fall of Dogra empire in 1947 failed to make a mention of him. The Coalition of Civil Society, an amalgam of several voluntary organizations constituted an award in his honour three years ago. The first award was given to an American Patricia Gosman for her works on Kashmir. Last year’s award went to Aasiya Jeelani who was killed in a landmine explosion at Kupwara while monitoring Parliamentary elections. This year the award has not been given till date. The society has also published some literature and now people have started recognizing him as a national hero. People especially those involved in a struggle for the enforcement of their rights must know their roots. They must know the persons who stood up for their cause. But every step is being taken to keep the younger generations unaware of various political developments for obvious reasons. The Jammu University has set up the Ghulab Singh chair to honour the ruler considered in this part of the state a colonizer. The government also cannot escape responsibility. Most of the Kashmiris believe that the freedom struggle started in 1931. Had the government taken appropriate measures and presented Kashmiri history without distortions Robert Thorp would be a household name in contemporary Kashmir. However, the wrongs can be rectified even now. Let the government introduce Kashmiri history as a compulsory subject. Let people know their heroes. Let the world know how Kashmiris have suffered and at whose hands.